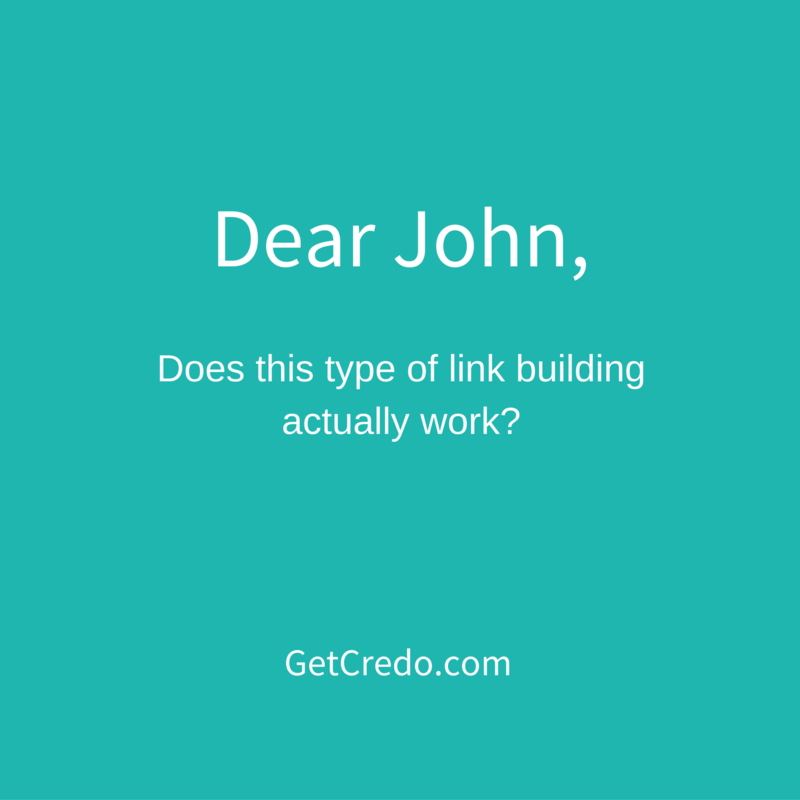 Dear John: Does This Type of Link Building Actually Work? Welcome to Dear John, a new (hopefully weekly) column where I’m going to answer questions about SEO/digital marketing in longer formats. If you have a question you’d like me to answer, please email it to hello at getcredo dot com with the subject starting with [DEAR JOHN]! Doing a small SEO project for a local dermatologist and when reviewing competitor link profiles I found one site that was earning a TON of links from other doctors throughout the country. From what I can tell, it looks like this web development company builds medical practice sites, then puts a page on each site that links to all other practices they created site for. Does this actually work? What would the name of this be? Recipricol links? Link farm? Does it work? Yeah, probably. For now. Should it work? Probably not. I obviously haven’t seen the sites, but if they’re hosted on the same hosting account with the same IP address, then it wouldn’t surprise me if this was eventually hit. And if it was reported, it definitely would not pass a manual review by the Google spam team IMO. As others have said, it’s super risky. Just a few weeks ago I didn’t let someone join my platform to provide local SEO services specifically because they are doing this sort of thing as their main link acquisition tactic for their clients, and while it works right now it’s definitely very grey hat and will stop working at some point. I’ve spoken with people who used to operate Personal Blog Networks like this, and they always get hit eventually. I’d also hate to be the SEO brought in to clean this sort of thing up and get the clients that this company loses ranking again. Lots of small businesses sound like they’ll be harmed because of this, unfortunately. Have a question you’d like me to answer publicly? Email it to me – hello at getcredo dot com – and start the subject line with [DEAR JOHN].